Sometimes the apple falls far from the tree. 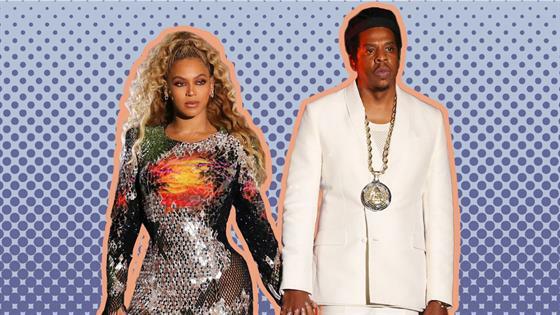 While Beyoncé is notoriously private on social media, choosing to carefully curate her feed and offer crumbs of personal photos and news to ravenous fans, her mother, Tina Knowles Lawson, isn't as selective. In fact, she often offers up the whole damn cookie on her Instagram feed, which is a treasure trove filled with corny jokes, over-posting from family events and the occasional appearance from her superstar daughter, along with granddaughter, Blue Ivy. Since joining the social media platform in August 2015, Tina has amassed 1.8 million followers, with many of them always on the look out for a Queen Bey sighting. And when Tina, 64, delivers, she really delivers, inadvertently offering fans a glimpse into the star's private side off-stage. And guess what? She's actually just like us...often embarrassed by our mom on social media. And there was no better example of that then this past October, when Tina got a little too snap happy at the Halloween party Beyoncé and Jay-Z hosted. Though she ended up changing the caption, Ms. Tina revealed Queen Bey called her "TMZ" after she posted 29 (Yes, that's right: TWENTY NINE) Instagram posts from the event. Clearly, someone got another message soon after that because Tina then changed the caption to "MY Super fly! His Foxy Brown!" The "paparazzi" call-out by Bey seems to be an ongoing theme for the Knowles fam, as Solange also has poked fun at Tina's documentation, calling her "Mamarazzi." Since joining Instagram, Tina has taken to posting a corny joke of the day, which finds her recording a selfie telling a--you guessed it--really corny joke. Now, if you follow Ms. Tina you know she is very serious about her lighting, and will sometimes record a few videos at once to post later. It seems Bey finds this as hilarious and amusing as we do, as you can hear her yell in the background of one corny joke post, "You found that light!" Tina later explained in a video that her daughter had talked to her about her corny jokes post, saying, "Beyonce was telling me the other day I shouldn't do corny jokes all the time, but I told her when you get my age you gotta find your light!" She then clarified her comment in the caption of that video when fans misinterpreted what Bey was trying to say to her aspiring comedian mother. "You guys are misunderstanding what I was saying, or I didn't explain it well. Beyonce was saying it's obvious mama that you are videoing several jokes at a time . ( on the same day) you don't have to put one out everyday," she wrote. " When I said good light I meant literally good light!!! Gods light! Haha not a spiritual lite. So I was saying if I look okay in the light I'm going to video several at the same time. My children never try to take my light from me. But I don't t think anyone likes their mom on instagram do you?" So there you have it: Beyoncé doesn't like her mom on Instagram...but will still step in to record a video if needed, a true sign of daughterly love and devotion, which ended up backfiring on the mom of three. While recording one of her videos on a vacation, Jay-Z and Blue Ivy played Tina's "straight men" during a knock knock joke...a particularly corny one. After telling it, Tina says that Beyoncé gave it to her. "Oh no, God!" Bey, who is recording the video, groaned. "She cut the camera off on me," Tina wrote. But Jay has also been roped into playing videographer for his mother-in-law on occasion, documenting her jump off of a boat. Are you dead yet? Please resuscitate yourself if so because there is more. So much more. Aside from occasionally filming Tina's videos, Bey will actually art direct her photos, too. "My baby took this photo," Tina captioned a photo of her outside the old beauty she would hang out in in Houston. "She done good." Tina returned the favor though, snapping a photo of her daughter after Bey spotted a good backdrop. "She has such a great eye," Tina gushed. Though Bey never officially confirmed she had a Snapchat, Tina did it for her by sharing a few instances of her daughter's familiarity with the app's filters. In 2016, Tina learned about Face-Swapping thanks to Bey, who sent her a video that her mom decided to share on Instagram. "Her face and my face together. Her voice coming out of my mouth," Tina wrote, "or maybe it's her mouth ! Hell I don't know...Really weird!" See, even Queen Bey will waste part of her day playing with filters on her phone. And Tina was living for the flower crown filter everyone was obsessed with in 2016 when she eventually discovered it, revealing her daughters were already so over that trend. "My kids said mama that is soo old . As usual I am 'Late,'" she said. "My nephew Johnny used to say She is ' Late ' honey. I'm bringing that back. When some thing is out of style let's call it ' late.'" Of course, given her social media reach and pretty loyal following, Tina dipped her toe into the land of Spon-Con, teaming up with J.C. Penney for some ads last holiday season. In the video, Tina revealed she got a deep fryer for Bey "so that she can fry things." Please let the visual of Beyoncé unwrapping a deep fryer on Christmas morning keep you warm at night in the coming winter months. Of course, given Beyoncé's reputation as a perfectionist, Tina's themed Lemonade posts after the 2016 release of her historic Lemonade album proved just that. We got a glimpse at Blue Ivy's lemon-print dress, as well as the lemonade toast they all shared to the album and HBO special's success. We've learned that Bey loves to drop a pop culture reference when it comes to her mama, having once told her mom she was "Looking like Felicia from Friday Bye Felicia!" when she had plaits, and likes to call her "Turn Up Tina" after Tina Turner. Hair washing day , plaits ! Bey said i'm Looking like Felicia from "Friday" Bye Felicia! Tina has also revealed her personal trainer sends her photos of Bey as inspiration to "not eat a taco" and has admitted several times to stealing clothes from her daughter, including a "rasbeery beret" and a dress to wear on New Year's Eve. "I found it really funny because my baby was so generous to give me this dress out of her closet to wear for New Year's Eve. I was like 'there is a cute T-shirt dress in your closet and it doesn't look that expensive," she wrote. "She said uhhh ' that's a Givenchy dress mama' 'ohhhh' So really Her mama got it from her." But it's not also jokes and filters shared between the mother and daughter, as Tina revealed a serious conversation the two women had before Beyoncé's historic Coachella performance in April. "I told Beyonce that i was afraid that the predominately white audience at Coachella would be confused by all of the black culture and Black college culture because it was something that they might not get. Her brave response to me made me feel a-bit selfish and ashamed," she wrote. "She said i have worked very hard to get to the point where i have a true voice and At this point in my life and my career i have a responsibility to do whats best for the world and not what is most popular " She said that her hope is that after the show young people would research this culture and see how cool it is, and young people black and white would listen to " LIFT EVERY VOICE AND SING and see how amazing the words are for us all and bridge the gap. She also hopes that it will encourage young kids to enroll in our amazing HIstorically Black Colleges and Universities . I stand corrected." Aside from dropping juicy teases about Bey, Tina has also blessed us with some Blue Ivy greatness, often showing off her 6 year old granddaughter's personality. When the duo visited the ballet in Paris, Tina was breaking the rules by filming inside of the theater. We learned in the video that Blue is quite a stickler when it comes to following the rules. "You're not supposed to take videos, Grandma!" you can hear her saying in the background. "You're not supposed to!" Blue proved to be the "voice of reason" for her grandmother again when Tina was jumping off of a boat, with Blue asking a very practical question. "Do you know how to swim? Do you really know how to swim?" And even on Halloween, Blue was there to keep her grandmother in line for their group costume as Salt-N-Pepa. Even though she's clearly wise beyond her years, we also learned that Blue is just like the rest of us mere mortals sometimes and can't resist a viral video, with Tina revealing her granddaughter had watched the one below "200 times." So next time you are embarrassed by your mother on Instagram take comfort in knowing that even Beyoncé has to deal with the same problem.